This is a tool for creating sound effects my mixing several preset sound clips. Mirolit Halotea is a unique application for sound atmosphere creation. Using the built-in presets or adding one’s own you could create a sound atmosphere to shut off whatever disturbing noises would be there in the environment. You could easily create a sound environment that stimulates you or relaxes you. Sample is a separate audio file (OGG file) and is a short sound bite (e.g. dog barking, birds singing, thunder) or long fragments used for the background (e.g. the sound of rain, rustling of a forest). Preset is a set of samples with customized sounding settings. It could be used to create the preset "Thunder in a Forest" (for example) by combining samples of rain in the forest and sounds of thunder. The tool provides features through a good organizing structure. Existing library as well as the new customized sample and themes you create are handled by this tool. The interface is simple but you will need some familiarization time to get used with the concept and the use of the corresponding tools to achieve the sound effect you want. All the presets are divided into groups, so that it is easy to find required presets as well as add them easily to the chosen sound themes. Halotea has a built-in audio player. That will let you play the effects while you play your favorite sound atmosphere. So that you do not forget important events or a scheduled meeting, the tool includes alarms for scheduled events. This is a nice and different kind of product. Mirolit Halotea is the unique application for sound atmosphere creation. It is created for the people who have stressful and intense job, who have small children, who want inner balance, who want to sleep peacefully. With the help of sounds we can either stimulate person's nervous system or calm it down. 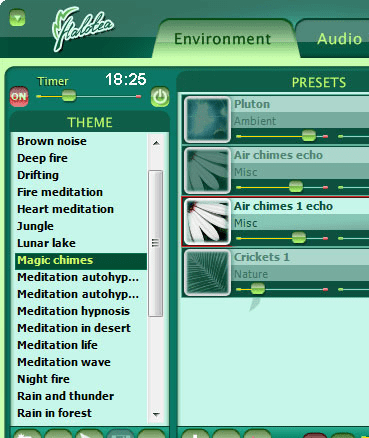 Just pick your favorite sound theme, turn on the volume, and enjoy pleasant and relaxing sounds of the nature. You can also create your own presets and sound themes. This will allow you to create the sound surrounding, that matches your mood and can help tune in to your personal rhythm of work or leisure. The generation of the unique sound themes in Halotea is based on a repetition of individual sound samples from our huge high-quality library using random parameters. This allows the creation of realistic and unique sound. All the presets are divided into groups, so that it is easy to find required presets as well as add them easily to the chosen sound theme. Intuitive interface allows a quick creation of your own preset from the application sounds or from your own sounds. You may use this application for meditation and concentration. Of course, it will be interesting to listen to your music files simultaneously with the sounds of Halotea. For this purpose Halotea has a built-in audio player. Create your new sound! Halotea has built-in recorder which records sounds in the OGG format that is played back by many modern portable devices. While working at the computer or relaxing, you can easily forget about important events or a scheduled meeting. Don't worry - the built-in alarm clock will remind you of the scheduled events. This clock may not only alert the user by audio and visual signals, but also perform some pre-configured actions, like starting an application, turning off the computer, etc.